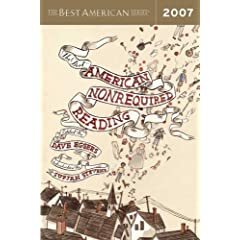 I have been reading the Best American Nonrequired Reading series for several years, and have fekt that in the past couple of years the quality of the included pieces has dropped. Perhaps it was a move towards bigger sources or a change in editorial approach that didn't jibe with my tastes, but I picked up this year's edition with more than a bit of trepidation. Fortunately, this year's Dave Eggers-edited volume restored my faith in the series. With an introduction by singer-songwriter Sufjan Stevens (where he discusses learning to read), the book is filled with articles and stories culled from weeklies, magazines, newspapers and even websites. The inclusion of a short story by Largehearted Boy Book Notes participant Patrick Somerville made me smile, as did an Ann Packer story first published online at Five Chapters. My next book is the Chris Ware-edited edition of The 2007 Best American Comics.